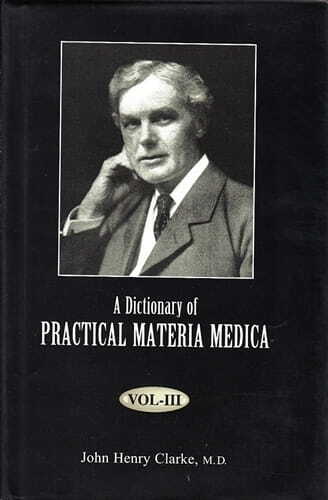 John Henry Clarke consulted Allen, Hering, Hughes, Jahr, and Lippe, among others, in the writing of his 3 volume Dictionary of Practical Materia Medica. Offering over 1000 remedies with information about indications, keynotes, relationships, alternative names, causations, affinities and more. Every homeopath should be familiar with this book. Almost all the remedies whose definite use has been recorded in the homeopathic literature are included in the book. The clinical uses of the remedies are discussed, cases are given as examples, and the remedy symptoms are listed using the Hahnemann schema. The important features of Clarke's dictionary are the clinical conditions and the description of general nature of the remedy, described under the heading characteristics. This work of Dr. Clarke along with the Repertory of Materia Medica are recommended by the FDA's rule on "Condition under which homeopathic drugs may be marketed."